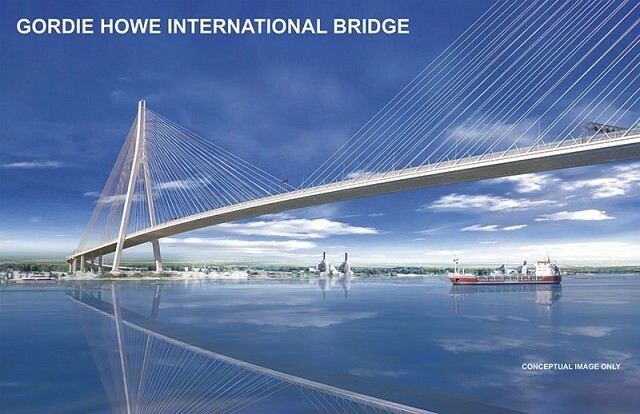 Construction consortium Bridging North America has been selected as the contractor to build the new Gordie Howe International Bridge between Windsor and Detroit. Officials announced the contractor Thursday at a media event at the University of Windsor. Bridging North America was selected following a rigorous evaluation of the proposals submitted by three proponent teams. The criteria evaluated included: project schedule management, the design and build approach, the durability of the infrastructure, community benefits, operation, maintenance and rehabilitation plans, measures to ensure compliance with architectural criteria, and the robustness of the financing plan. The technical and financial proposals were evaluated by subject-matter experts with extensive engineering and financial expertise and the evaluation was overseen by an independent fairness monitor who provided an independent opinion confirming the fairness, openness and transparency of the process. The Bridging North America consortium consists of ACS Infrastructure Canada Inc.; Dragados Canada Inc.; Fluor Canada Ltd.; AECOM; RBC Dominion Securities Inc.; Carlos Fernandez Casado S.L/FHECOR Ingenieros Consultores, S.A.; Moriyama and Teshima Architects; Smith-Miller + Hawkinson Architects, LLP. The project includes the Canadian port of entry, the bridge, the US port of entry, and the I-75 interchange. 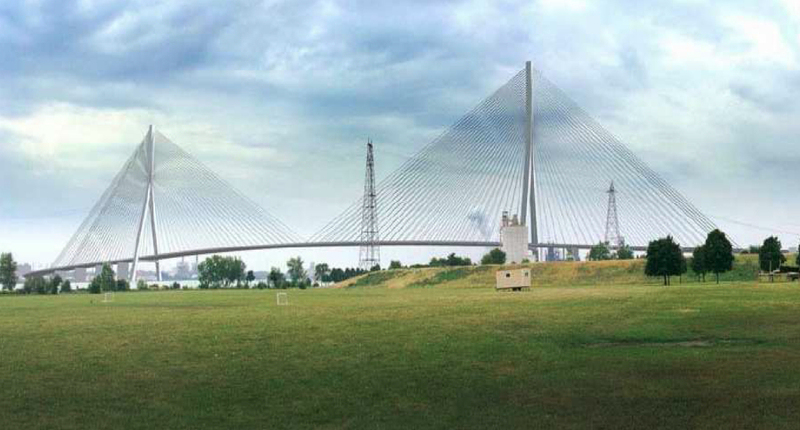 Officials also announced the design of the bridge would be “cable-stayed”. Windsor-Detroit Bridge Authority CEO Bryce Phillips said the bridge will have the longest main span of any cable-stayed bridge in North America at 853m, and the towers will be higher than the Detroit Renaissance Centre. The cable-stayed option has been selected. Construction is set to begin later this month. Over the coming months, the bridge authority plans to negotiate final contract details with Bridging North America. The cost of the project, design details and expected construction schedule are expected to be announced by the end of September, signaling the contract has been awarded and signed. An earlier version of this article incorrectly stated Aecon, instead of Aecom, was part of the Building North America group.